The Turtle Shell connects wirelessly to a smartphone, tablet, laptop, or any other Bluetooth-enabled device and has a slick, minimalist aesthetic. It even has built-in speakerphone and microphone functionality, so if you’re streaming music from your phone and a call comes in, you can answer it on speakerphone. And for a surround-sound stereo experience, you can connect multiple speakers together. Dimensions: 2.45" x 5.86" x 4.17"
Ruggedized technology has a tendency to look the part—bulky, reinforced and armor-like. But the Turtle Shell wireless boombox from Outdoor Tech is different. It has all the features for outdoor exposure, yet with a slick, minimalist aesthetic that makes a statement indoors, outdoors, and anywhere in between. The Turtle Shell connects wirelessly to a smartphone, tablet, laptop, or any other Bluetooth-enabled device. 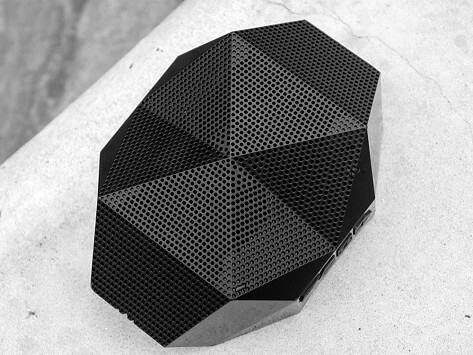 It can stream audio up to 32 feet for 20 hours on a single battery charge. It has built-in speakerphone and microphone functionality, so if you’re streaming music from your phone and a call comes in, you can answer it on speakerphone using the Turtle Shell. A rubberized coating on the angular shell is waterproof, so you can rinse it off in the sink if you spill a drink, drop it in the mud, or use it in the rain. It’s also shock-proof and resistant to dust. The Turtle Shell fits in the palm of your hand, and it comes with standard camera threading built into the base, which allows for multiple mounting options (such as on a bike). It also has a clip for secure hanging. The founders of Outdoor Tech, Caro Krissman and Mikie Krisztal, were inspired to create products that blend modern technology with their drive to be outdoors. 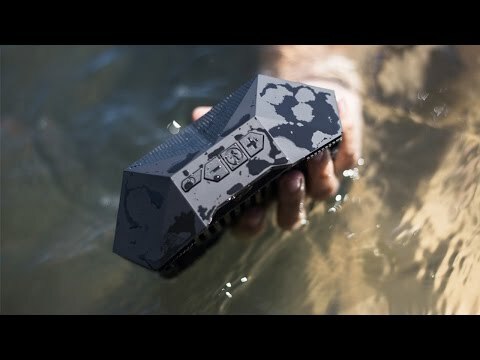 With their rugged-yet-refined Turtle Shell, you can stay connected to your tunes and your phone without being tethered to them. Where will you take the party?